This story is also featured on Sports Illustrated's "The Cauldron"
For all of the noise the past few weeks about the NFL’s declining ratings and quality of play, the 2016 NFL season is the most competitive in league history. Through the season’s first seven weeks, the average margin of victory is 10.0 points – second lowest in history behind 1932, when teams combined for only 16.4 points per game. When measured relative to total points per game (45.4 in 2016), this season’s 10-point margin of victory is the lowest ever (22%). This close-game phenomenon is particularly apparent in this week’s betting lines. As everyone from seasoned gamblers (namely Cousin Sal on the Bill Simmons Podcast) to casual suicide pool participants has observed, Week 8’s lines look awfully low. Indeed not one team is favored by more than six points (or 6.5, depending on where and when you look). Sure enough, Week 8 of 2016 features the lowest average line (3.3 points) in at least a decade, surpassing Week 1 of the 2010 season (3.6 points) thanks to some spread compression today. This week's average is 2.1 standard deviations below the weekly average since 2006. Overall, only eight weeks since then had average lines below four. 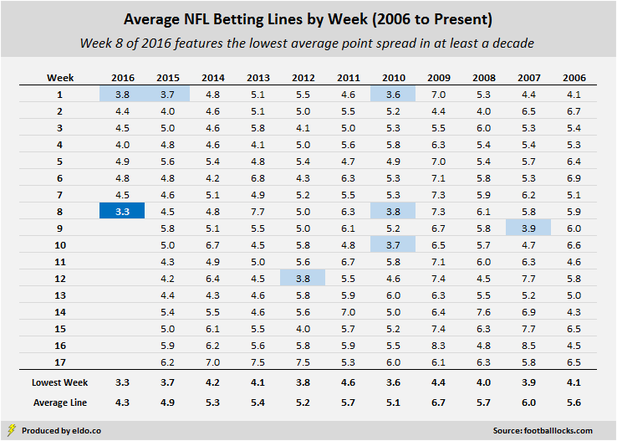 Week 8 of 2016 and Week 1 of 2010 are also the only two weeks since at least 2006 without a single favorite of a touchdown or more – which requires a special set of circumstances. This week, the five worst teams in the NFL are on a bye (SF), playing against each other (TEN, JAX), or at home (CHI, CLE). Meanwhile, 15 of the 16 teams with a winning record are off (NYG, PIT), playing each other (DAL-PHI, GB-ATL, HOU-DET, BUF-NE), or on the road (KC, MIN, OAK, SEA, WAS). The lone exception is Denver (5-2), whose strong defense and mediocre offense generate a 4.5-point line at home against the feisty Chargers (3-4). On top of scheduling happenstance, the 2016 NFL is yet to produce a great team that might reliably yield high lines. New England (6-1) comes closest, but they’re six-point favorites on the road this week against a solid Bills team (4-3). And despite their 5-1 record, Minnesota’s offense is so bad that they’re only 5.5-point favorites at Chicago (1-6). If the NFL ship is sinking (or at the very least leaking), at least it's giving us close games on the way down. ﻿﻿The data sources for this article are footballlocks.com and pro-football-reference.com. Includes the regular season only. Data was compiled and analyzed by ELDORADO. All charts and graphics herein were created by ELDORADO.